DB2® provides various installation methods as well as features and tools to deploy a large number of clients and servers. Database administrators, application developers, and application architects have a number of available options when deploying DB2 9.5 for Linux® , UNIX® , and Windows® (DB2 for LUW). 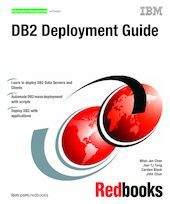 Focusing on the DB2 V9.5 deployment methodology, this IBM® Redbooks® publication provides general guidance and serves as a reference resource for DB2 based solution deployment. These techniques and considerations are also applicable to other recent versions of DB2 for LUW. Deployment begins at planning. We introduce various DB2 for LUW products to help you choose the right DB2 product for your enterprise. DB2 9.5 can be installed interactively using a graphical installer, or in a silent install where input is passed to the installer through a response file. We show details on how to deploy DB2 servers and clients to both single and multiple systems using the DB2 provided functions and features as well as a customized script. We also describe how to deploy DB2 through Microsoft® System Management Server (SMS). In addition, we cover how to deploy DB2 with various applications, including Java™ , C/C++, PHP, Python, Ruby, Perl, and .Net. Finally, we explain how to deploy a pre-configured database.